Japan has long fascinated the West (and of course vice versa). In particular, this Asian country shares many similarities with Britain. It comprises, for example, a group of islands lying just off a continental landmass and supports a large human population. Behind the superficial similarities, however, lurk some significant differences. Japan spans a much wider range of ecological zones than Britain and, despite its dense population, hosts a surprisingly diverse community of birds and other wildlife. Japan’s north is blanketed in heavy winter snow and touched by sea ice whilst its south is truly tropical. Within the same country can be found eagles, bears, snow-dwelling monkeys, cranes and exquisite paradise flycatchers. Japan is, however, a land of contradictions, famed for its reverence for nature, for the proliferation of crane imagery in its art and everyday culture and for the national attention lavished on the advancing cherry blossom of spring and the turning of the autumn leaves. At the same time, Japan is the world’s leading importer of hardwood, continues to hunt whales and has girdled much of its own coastline and riverways in concrete. All these fascinating themes are fully explored in Mark Brazil’s new book. The author is well known here in Britain for his much-respected avifauna, The Birds of Japan, for his bird-finding guide to the islands and for the more recent Birds of East Asia field guide. This is, however, a different type of book - an anthology, a collection of essays written over thirty years, mainly for the Japan Times. 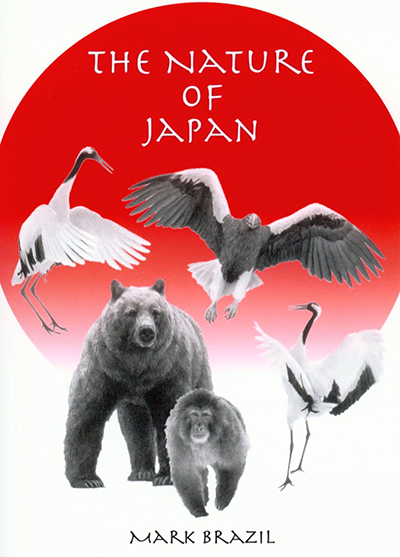 All Japan’s famous wildlife (and some not so famous) is covered in these essays - Steller’s Sea Eagles and Red-crowned Cranes, Brown Bears and Sika Deer, Japanese Macaques and Giant Salamanders. The result could potentially be chaotic but a sense of order and coherence is given by grouping the essays according to the calendar, the birds, mammals and other creatures all marking the slow turn of the year. 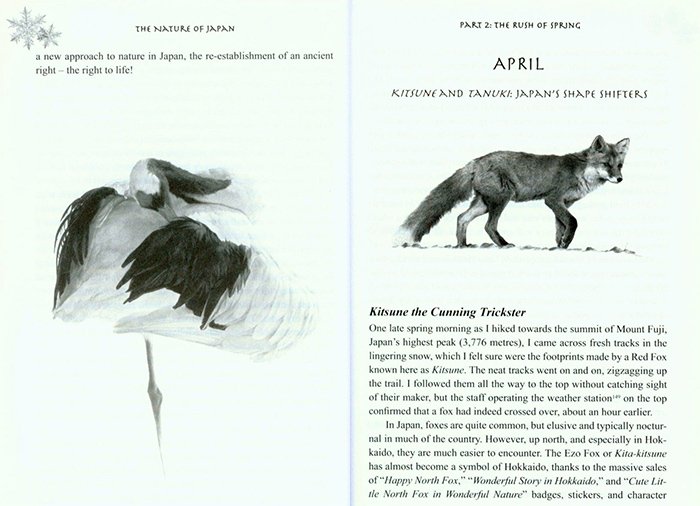 The text is enlivened by some exquisite artwork by Hisashi Masuda. Brazil is amply qualified to be our guide to this fascinating country. He has lived there for more than thirty years and has both travelled extensively and immersed himself in the daily and annual rhythms of his home island of Hokkaido. His long experience shows in his writing, full of genuine first-hand observation and personal discovery. As befits the genre (the newspaper article), his writing style is open and accessible, aimed at attracting and sustaining the reader’s attention. Please read before ordering: When ordering the total displayed on your shopping basket excludes the discount above but this will be applied before final payment is taken. The author does not shy away from controversy and from addressing the huge array of conservation choices facing this country. In a land with a complex and highly nuanced social etiquette, renowned for ‘saving face’ and for skirting around difficult topics, it is commendable that Brazil pulls no punches, being highly critical of, for example, big business, wasteful consumers and even over-eager photographers. His conclusion is hard-hitting – Japan’s reputation for environmental stewardship is not borne out by the reality, its oft-cited reverence for nature only skin-deep, a preoccupation with imagery rather than a real engagement with the natural world. It is initially surprising that such arguments have found an outlet in the pages of a national newspaper but perhaps they are more easily accepted from a foreigner. Despite these entirely necessary discussions, however, this book is no environmental diatribe. Brazil’s essays are the perfect guide to Japan, full of genuine contact with its wild nature, a rich store of observation, insight and reflection. Japan is like nowhere else - disorientating, baffling but ultimately fascinating. For anyone who has experienced this unique country these essays will conjure up treasured memories and for anyone yet to do so they will surely inspire a visit. I cannot recommend them highly enough.